When writing code using the Paho Python client you would have had to use the loop() function . In this tutorial we will look at what it does, and why it is necessary. 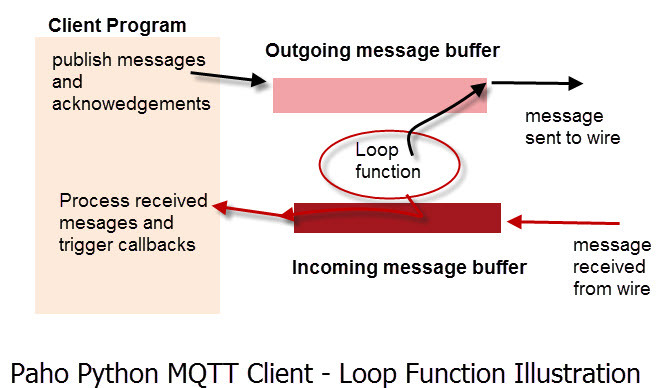 When new messages arrive at the Python MQTT client they are placed in a receive buffer. The messages sit in this receive buffer waiting to be read by the client program. You could program the client to manually read the receive buffers but this would be tedious. The loop() function is a built in function that will read the receive and send buffers, and process any messages it finds. On the receive side it looks at the messages, and depending on the message type, it will trigger the appropriate callback function. See Understanding callbacks. For example if it sees a CONNACK message it triggers the on_connect() callback. Now instead of manually reading the receive buffer you just need to process the callbacks. Outgoing messages and message acknowledgements are placed in the send buffer. The loop function will read this buffer and send any messages it finds. See network loop in docs for function reference. The loop_start() starts a new thread, that calls the loop method at regular intervals for you. It also handles re-connects automatically. To stop the loop use the loop_stop() method. The loop_forever() method blocks the program, and is useful when the program must run indefinitely. The loop_forever() function also handles automatic reconnects. The loop can be stopped by calling loop.stop(). You should stop the loop before you exit the script. You can also manually call the loop() method in your program. If you do this you must remember to call it regularly. Because the loop is a blocking function I call it with a timeout the default timeout is 1 second. If you call the loop manually then you will need to create code to handle reconnects. Important! If your client script has more than one client connection then you must call or start a loop for each client connection. For example, if I create two clients client 1 and client2 in a script, then you would expect to see client1.loop() and client2.loop() in the script. If you are using the loop_start() function then you will probably need to stop the loop automatically if the connection fails. The easiest way of doing this is using the on_disconnect callback. However you should only stop the loop if you are completely finished, and are going to exit. Stopping the loop will stop auto reconnects unless you take steps to call the loop manually. If your script connects using multiple clients then each client will need a loop. Therefore if you are using the loop_start() method then you will need to call it for each client connection. Therefore if you have 2 client connections you will need two loops which equals two additional threads. For 2 clients it isn’t really a problem, but what if you have several hundred client connections then you will need several hundred additional threads. In this situation it is better to manually call the loop for each client and use thread pooling. I will cover this is another tutorial at a later date. However for up to around 20 client connections then is is easier to use the inbuilt loop_start and stop functions. Q- My callbacks aren’t being called. Why is that? A- You need to start a loop or call the loop() function to process callbacks. Q- My script has ended but the loop still appears to be running? A- It probably is. You need to stop the loop before exiting the script. Q- Why call the loop manually when you can use loop_start()? A-The main reason is when the script has lots of client connections (>20) as if you use loop_start() then you need a loop for each client. The built in loop functions will process the receive and send buffers to send and receive messages and message acknowledgements. To make life easier use the loop_start and stop functions unless you have 100’s of client connections. Hi Steve. Thanks very much for your great series on mqtt which has enabled me to get a nice start on my home automation using node-red. One issue I have as a newbee is that during the loop, paho seems to be catching and not reporting all Python run-time errors. It’s been a challenge to debug my code as things like calling the wrong function name or even a bad string constructor are hidden. Is there a solution for this? Thanks again. I posted a message on one of the topics asking for trouble shooting advise re: connect – disconnect -connect ; would not connect. I forgot where I posted the orginal message. It connect correctly and I receive correctly the first message and use loop_forever waiting for the next message scheduled 30sec later. However the script crashe imediatly after this first uplink. Did you say you received the firstt message OK? Take the loop_start and stop outside the while loop and don’t use loop_forever as well as loop_start and see how it goes. Use the ask-steve page to send me the python console output if it crashes. I have a script that is able to receive MQTT events (I use on_message callback). My client is connected with connect_async method. The problem for me is that the thread responsible for handling this connection waits for one message to be proceeded to be able to get another message from the incoming message buffer. Is it possible somehow to start the message processing as soon as it gets to the buffer without waiting for the previous message to be handled completely? E.g. creating new thread for message handling? Each message will activate the callback and you can only have one callback active for that client connection at the same time so that callback has to complete before it can be triggered again. The message can be passed to the main thread using a queue and so it can be processed while the callbacks are active. In many of my scripts the on_message callback drops the message in a queue and I unpack the queue in another thread. I can send you an example if you want. Thanks for the light about threading and multiple clients, there is not that much tutos. I have by the way some issues implementing it. I have a broker on a gateway where the sensors send messages, and a cloud broker one where the gateway send final results. I have to subscribe to both broker topics. I followed your tuto with the thread but I can’t see my messages, and it seems the client.connected_flag=True doesn’t seem to execute ..
Do you have an exemple to show for the base please ? With only two connections you might just want to start two client loops. However I will send you two scripts to your email address that use threading and futures. They are scripts for testing brokers that I’ve written and may be useful to you. I’ll try to put together a tutorial to over multiple client connections in the next few weeks. You mentioned the default loop timeout is 1 second. No not in loop_start().There is no need as the 1 second is the maximum time it blocks before returning. As it runs in its own thread it doesn’t make a difference. client.loop(.01) will only block for 1/100 of a second. for each client object in the clients array do i have to associate the callbacks as part of the for loop? Do you mean call an “on_message” function and checking first if msg includes a payload or not? Yes in the on_message callback check that the payload length isn’t zero if it is don’t try to decode it. Hello Steven! Hope that everything is fine. ….more data in this function…. A quick guess would be that the json module doesn’t like an empty string. Try testing for an empty payload before decoding.Let me know if that works. However, I need to understand one more concept for published data. I have a publisher sending some data at given interval of time lets say 3 seconds once. But on the subscriber, I have a loop based on the published data to be run. If my subscriber takes 5 seconds to execute this loop, I am unable to process the second published message as it comes in and executes only once the previous loop completes. Now, If my concepts are not wrong, once the message is being passed into the function call, it should return to the main where I call the on_message and look for next incoming message. This is not happening. And I am using loop_forever() for continuous connectivity. The on_message callback runs in a separate thread and so doesn’t slow down your main loop. What are you doing with the message you receive? If you email me the entire script I’ll look through it. So if I want my loop to run forever, but I want to run other functionality at the same time (in another thread), I can just use loop_start() and let it handle the reconnects and never stop it? Why is it necessary to stop the loop before exiting the script? Exiting the script means the client is not more active right? And it shouldn’t really matter then, given the client itself doesn’t exist after exiting the script. Because the loop will still be active even when the script ends as it runs in a different thread. When you close the command console or IDE console it will be stopped. Can I bind the callback after connection? Yes but you will miss the connect acknowledge callback if you have already started a loop. Okay thanks a lot. So the loop_forever() should always be started after attaching all the interested callbacks? I have added the loop_forever() at the very end of the code, so that i dont miss processing any callbacks. Yes attach the callbacks before you use the loop. I have been having a lot of trouble with this on a recent project. This helps explain the expected behavior, but it really doesn’t seem to work this way in my set up. I’m connecting to a device that uses TLS encyption. I set this up and connect just fine, using loop_start(). The client will occasionally disconnect (randomly), and I catch tis in the on_disconnect() callback, and I do call loop_stop() there (as you suggest). The problem is that the client is not automatically reconnected as you say should happen – and if it did – where would you call loop_start() again? the on_connect() callback would not process the CONACK as the loop is not running. What I’m doing is ctching the rc value in on_disconnect, and if it’s not 0, calling connect again. In my case, client.reconnect() does not work (but has to be called for some reason), then when that fails, calling loop_stop() again, and setting the client up from scratch (including TLS encryption) then calling client.connect() again works. It’s a kludge, and not as simple as you imply it should be. I feel like I’m missing something. Any explanation for the way this is working? When you stop the loop then you stop auto reconnects so don’t stop it in the disconnect callback until you are completely finished. That is you don’t want the client to try to reconnect. When the flag goes False I stop and wait for the connection to be made again. Thanks, I feel daft now, I figured that out. removing the loop_stop() in on_disconnect() resolved all my connection/reconnection issues.